So I found myself waiting on a bench, waiting for my date. I'd been excited about this meeting for weeks, telling all my friends about it ever since it was confirmed. Really, I'd been waiting for this all my adult life. But what, I suddenly worried, if he doesn't like me? I shuffled nervously in my plastic blue scrubs and then the door opened and a woman beckoned me in. He was ready to see me. I should probably admit at this point that I was not having a romantic assignation; I was not even waiting for another human being. Rather, I was at the Chengdu panda research base in central China, which is also known as the holy land among panda fans. And pandas do have a huge fan base: a YouTube video of pandas on a slide has attracted more than 11 million views (cannily, it's entitled: "Cute pandas playing on the slide"). The 2004 film Anchorman satirised TV stations' fondness for furry black-and-white audience pleasers when it had local newscaster Brian Fantana (Paul Rudd) sent out on what the station calls Panda Watch! "Great story – compelling and rich," Ron Burgundy (Will Ferrell) muses in response to Fantana's latest Panda Watch report. When I saw the film at the cinema, everyone in the audience laughed at that point. 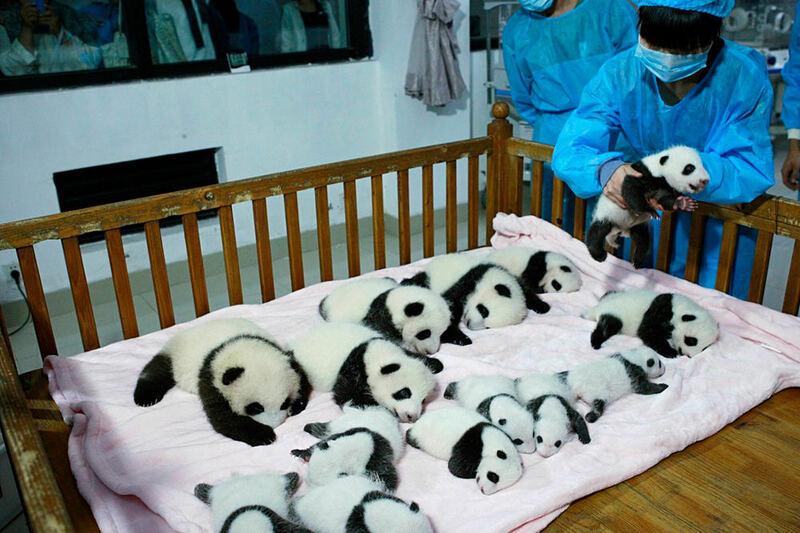 I, on the other hand, made a mental note to ask my editor for a Panda Watch assignment. A decade later, she finally sent me. Admittedly, there are many things to do in Chengdu besides look at pandas. Set on the western edge of the Sichuan Basin, Chengdu is a thriving but pretty megacity, where tourist attractions alternate between the very old (the beautiful Wenshu Buddhist monastery) and the ultra-modern (the New Century Global Centre, the world's largest building by floor area). While the city has long been known for its tea houses, and for food carts selling dishes spiced with the region's famous red peppercorns, it is also now the place where two-thirds of world's iPhones and 20 per cent of the world's computers are made. But I'm afraid there was only one statistic that really interested me about Chengdu: 80 per cent of the world's pandas live in Sichuan province. The Chengdu Panda Base, one of the best-known and respected panda conservation centres in the world, comes with some pleasing statistics of its own: it houses more than 80 pandas and is a mere 10 kilometres from downtown Chengdu. I did feel a twinge of guilt as my plane swooped in to land, wondering what it said about me that I really didn't care the least bit about the culture, religion or food – I just wanted to see some cuddly pandas. But seeing as my plane had a giant panda face painted on the nose (well-played, BA!) and the city itself was bedecked with panda tat, I decided to stop worrying and enjoy panda mecca. Chengdu Panda Base turned out to be, much to my relief, nothing like a zoo. The pandas have 240-odd hectares of parkland in which to scamper. And while the centre is very much a tourist destination (don't go on a national holiday or you will find yourself fighting for space with what seems like the rest of China), it is primarily a conservation and breeding centre. The pandas I saw, mostly black and white ones but some little red ones, too, all looked well cared-for, plump and relaxed, happily playing with members of staff (another tip: go in the morning to see the feeding). After watching the bears loll around and lumber about – and those do seem to be the two main forms of panda action – I joined the long but fast-moving queue to peer into the nursery at the litter of three-week-old cubs. Lying in their cot, they were so small and sweet I had to shove my hands in my pockets to stop myself stealing one. Just next to the main enclosure is a little villa where, for a fairly hefty fee (about $A200) you can hold a panda. As far as I know, this is the only place in the world where you can do this: I would have paid three times that. The one-year-old I already thought of as "my panda" was sitting on a wooden bench, like a small round emperor upon a throne, chewing on bamboo. I nervously sat down and immediately felt his heft and warmth as he leaned up against me. He continued to munch his bamboo thoughtfully and soon turned slowly, sweetly towards me and I looked into his panda face. We had our moment. I had my Panda Watch. And, as an experience, it was more than compelling and rich. This article originally appeared on guardian.co.uk This article was written by Hadley Freeman from The Guardian and was legally licensed through the NewsCred publisher network. The Guardian offers the latest in travel, news, sport, opinions and analysis in the United Kingdom and around the world.